Orchids are such amazingly beautiful flowers. in the terrarium/orchid arrangement in my kitchen. 'cause the flowers last a long time. bloom so I can enjoy them even longer. and four buds still to open up. color, then a flat white color, then sanded it down. Here we are down the three buds left to bloom. Poor little plant...did I water you too much? not enough? your leaves are droopy. stalk shrivel up and drop off. called "Orchids For Dummies" . Oh well, at least my terrariums are still alive. oh I love my orchids!!! I have a white and a purple in bloom now. Mine have rebloomed this is the 4th rebloom for the white and 3rd for the purple, I have one that the stalk died but the leaves are still healthy and it is taking a while to grow a new stalk. I keep mine in a sunny spot and water once a week, all the pots have bark and no soil. I drill holes in the pots so all water drains out and only bark remains wet. I was told they hate to sit in water and hate water on their leaves etc.....which I find weird because if they are in the wild they can't do much about that can they? lovely arrangement you have there!! That is just gorgeous. My friend's husband just sent her an orchid for Valentines day. It is so pretty, purple with all these new little buds popping all over. I really love the white. 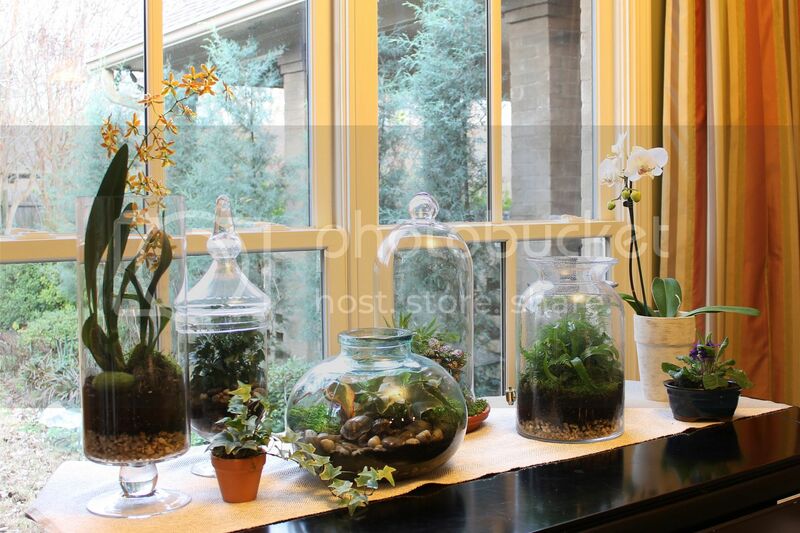 I love your terrariums, and now the pretty orchids bring an elegance to the vignette. Really beautiful spot in front of your window. Your orchid is beautiful and the terrariums are still looking great. A friend gave me an orchid once but after it died I haven't tried growing them again. Oh, I love white orchids and this one is sooo pretty. Gorgeous orchid! I need to bring one home. I don't have much luck with them.